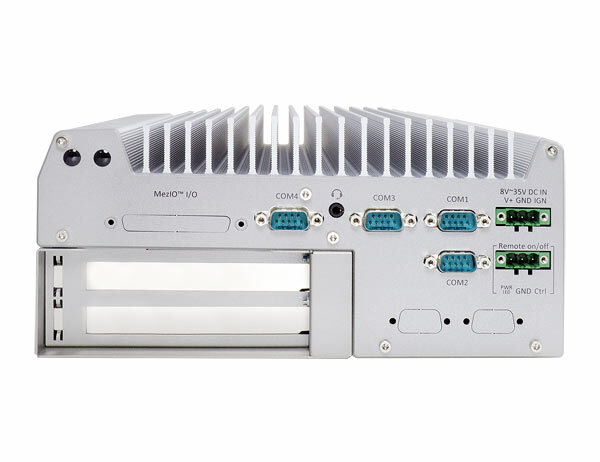 Nuvo-7160GC is a ruggedized GPU-aided edge computing platform designed for modern machine learning applications such as autonomous driving, facial recognition and machine vision. It supports up to a 120W GPU, delivering 4~6 TFLOPS computing power for inference, as well as Intel® 8th-Gen Coffee Lake Core™ 6-core/ 12-thread CPU, offering up to 50% CPU performance enhancement over previous generations. Thanks to Neousys’ patented Cassette design and ingenious ventilation mechanism, Nuvo-7160GC can effectively dissipate the heat generated by the GPU. By introducing the guided airflow from intake to exhaust with powerful fans featuring smart fan control, it allows a 120W GPU to operate at 60°C ambient temperature under 100% GPU loading. Nuvo-7160GC incorporates rich I/O functions such as USB 3.1 Gen2/ Gen1, GbE, COM and MezIOTM interface in its restricted footprint. It also leverages cutting-edge M.2 NVMe SSD technology for over 2000MB/s disk read/ write speed or Intel® Optane™ memory for the ultimate system acceleration. Neousys Nuvo-7160GC is the ideal solution for emerging edge computing by combining exceptional CPU and GPU performances.